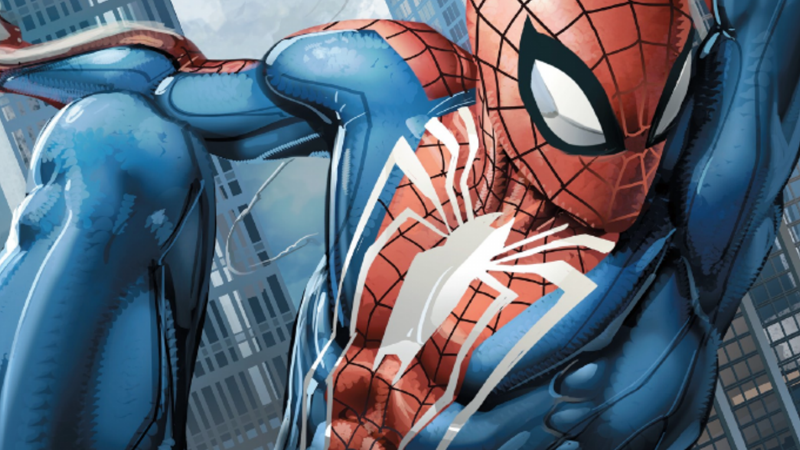 The Spider-Man of, err, Marvel’s Spider-Man swings into comic book action. Actually, consider this a double spoiler warning, because below are details of both Spider-Geddon #0 and the ending of the Spider-Man video game. Consider yourself doubly warned! Spider-Geddon, Marvel’s spiritual sequel to the excellent Spider-Man multiversal crossover event Spider-Verse from 2014, kicked off in earnest last week with Spider-Geddon #0, featuring two stories—one of which, “New Players” by Christos Gage, Clayton Crain, and Travis Lanham, marks the official debut of the new Spider-Man video game version of Peter Parker, dubbed the Spider-Man of Earth-1048 in Marvel’s vast catalog of alternate realities. It’s set shortly after the events of the game’s story, which is why it becomes so intriguing. Not only is this the chance to, at least character-wise, get a momentary continuation of arcs left open at the end of Spider-Man’s rollercoaster of a story, it means that the collision of his world with the world of the Spider-Verse suddenly becomes weirdly emotional. Jeez, Pete, if you think two Spider-Men is a lot, just wait for the rest of this event! Why? Because after the story opens with Peter being introduced to his reality’s version of the classic Spidey villain Tarantula, Pete finds his scrap interrupted by a herald from another world, beckoning him to fight along the Spiders of all realities against a cataclysmic force that could doom them all...the Superior Spider-Man. Better known, of course, as none other than Otto Octavius—formerly in the body of the actual Earth-616 Spider-Man, currently in his own tip-top super special clone body courtesy of...well, it’s a really long story that can basically be summed up as comic booooooooks. But anyway, it’s Otto Octavius, the former Doctor Octopus, now currently hell-bent on proving that, once and for all, he is the Superior Spider-Man to Peter Parker. But that doesn’t really matter to this Peter, because he is a Peter who, shortly before this interloper showed up, fought his own version of Otto Octavius—his tragically twisted mentor, employer, and friend—after he became the man Otto-616 used to be. The Superior Spider-Man learns of his counterpart’s tragic fate. It’s a deliciously dramatic premise that, even in a short space of time, Spider-Geddon #0 mines for all it can. There’s heartbreak on both sides; of course Peter is heartbroken when Otto reveals his identity not just because the memory of his fallen mentor brings back raw emotions, but because in the Superior Spider-Man he sees the man his Otto could have been if his failing body hadn’t driven him down a dark path. The Otto of Earth-616, upon learning of his counterpart’s fate, is haunted by his downfall—and, acknowledging that his body failing him way back in Amazing Spider-Man #700 lead him to where he currently is, has him vowing to never let it befall any Octavius in the multiverse again. With Peter hesitant to leave his duty as New York’s hero, or his support network in Miles and MJ behind, and Otto as brusque and impatient as ever to recruit Spiders in the fight against the inheritors, they briefly almost come to blows—a seemingly inevitable moment given the weird history these two share with their alternate counterparts in the multiverse. But it’s one made even more heartwrenching in a quiet admission by Peter: coming to blows with Otto Octavius instead of saving the world with him is an all-too-familiar scenario. Oh good, it’s like Christos Gage wanted to thrust a knife right into my heart. The two ultimately don’t come to blows—Octavius smartly plays to Peter’s noble side, offering to help capture the Tarantula so he can, with a free conscience, take a multiversal break from being the friendly neighborhood Spider-Man and pal around with...well, lots of himself. Himselves? In turn, as much as he openly shows his distaste for the pan-universal spider-schtick of acting like “a comedian on open microphone night” as he says at one point, Otto finds things to bond with and admire in this version of Peter—like their fascination with robotics tech, or even his rekindled relationship with MJ. “New Players,” as brief as it is, is full of little moments of emotion like this, a genius merging of the worlds of Marvel’s Spider-Man and the comic book universe that creates some compelling pathos which builds on what the still-fresh game created in its own universe and versions of these characters. As Spider-Geddon goes forward and inevitably mashes together more Spideys than you can shake a webshooter at, I hope the fascinating and compellingly sad bond between the Spider-Man of Earth-1048 and the Superior Spider-Man is a relationship it keeps near the foreground.